111 North Burnett Street, Wichita Falls Texas 76301. GPS 33 55'04.65" N 98 30'06.47" W.
For information about J. S. Bridwell at the Handbook of Texas Online, click the buttons below. Joseph Bridwell was born March 23, 1885, near Northview, Missouri. He moved to Wichita Falls in 1909 and went into the real estate business. 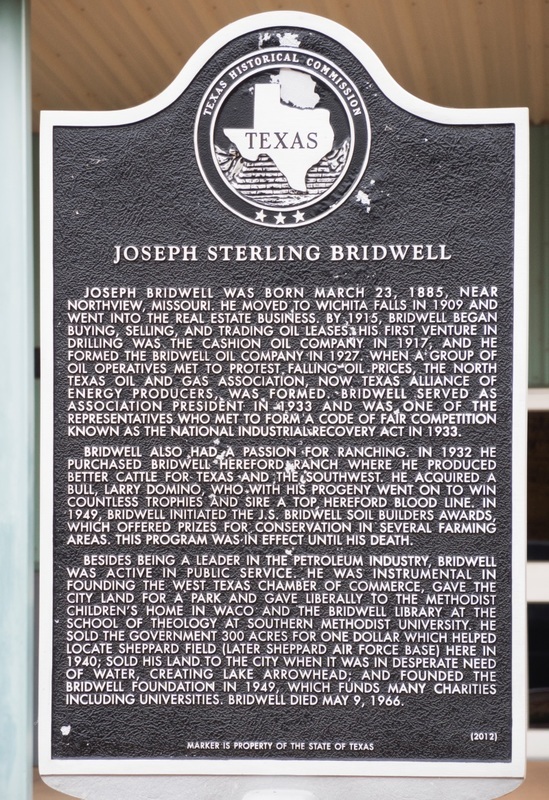 By 1915, Bridwell began buying, selling, and trading oil leases. His first venture in drilling was the Cashion Oil Company in 1917, and he formed the Bridwell Oil Company in 1927. When a group of oil operatives met to protest falling oil prices, the North Texas Oil and Gas Association, the Texas Alliance of Energy Producers, was formed. Bridwell served as association president in 1933 and was one of the representatives who met to form a code of fair competition known as the National Industrial Recovery Act in 1933. Bridwell also had a passion for ranching. In 1932 he purchased Bridwell Hereford Ranch where he produced better cattle for Texas and the Southwest. He acquired a bull, Larry Domino, who with his progeny went on to win countless trophies and sire a top Hereford blood line. In 1949, Bridwell initiated the J. S. Bridwell Soil Builders Awards, which offered prizes for conservation in several farming areas. This program was in effect until his death.